After a pretty seismically quiet first half of 2018, we have been catching up rapidly. The ultra deep Great Earthquake in Fiji. And now the Lombok sequence continues. The inhabitants and tourists in the Lombok, Indonesia region have been experiencing quite a few deadly and damaging earthquakes. This ongoing sequence began in late July with a Mw 6.4 earthquake. Followed less than 2 weeks later with a Mw 6.9 earthquake. Today there was an M 6.3 soon followed by an M 6.9 earthquake (and a couple M 5.X quakes). 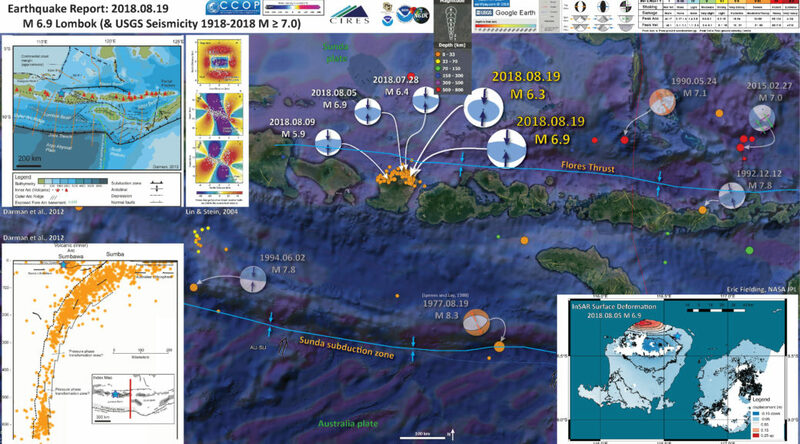 These earthquakes have been occurring along a thrust fault system along the northern portion of Lombok, Indonesia, an island in the magamatic arc related to the Sunda subduction zone. The Flores thrust fault is a backthrust to the subduction zone. The tectonics are complicated in this region of the world and there are lots of varying views on the tectonic history. However, there has been several decades of work on the Flores thrust (e.g. Silver et al., 1986). 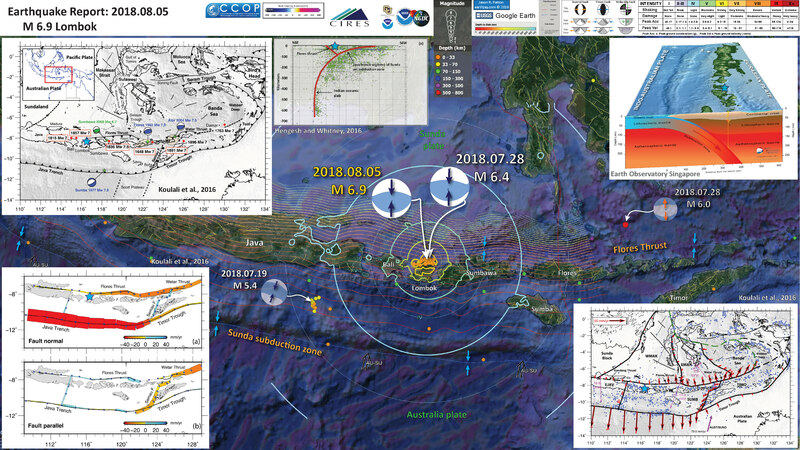 The Flores thrust is an east-west striking (oriented) north vergent (dipping to the south) thrust fault that extends from eastern Java towards the Islands of Flores and Timor. Above the main thrust fault are a series of imbricate (overlapping) thrust faults. These imbricate thrust faults are shallower in depth than the main Flores thrust. The earthquakes that have been happening appear to be on these shallower thrust faults, but there is a possibility that they are activating the Flores thrust itself. Perhaps further research will illuminate the relations between these shallower faults and the main player, the Flores thrust. There are 2 main ways that earthquakes may be triggered by a previous earthquake. Dynamic Triggering is when seismic waves are traveling through the crust from an earlier earthquake and these seismic waves increase the stress on a second or the same fault, causing a second (or more) earthquake. Static Triggering is when an earlier earthquake slips and deforms the crust/lithosphere surrounding the earthquake. These changes can impart changes in static coulomb stress in the adjacent crust. These changes can lead to increases or decreases of stress along faults in that adjacent part of the crust (e.g. Lin & Stein, 2004). Both types of triggering impart a very very small amount of increased stress on a given fault or fault system. This means that the way for an earthquake to be triggered in this manner, the potentially triggered fault will need to be on the verge of rupturing on its own. The stresses released by earthquakes are much larger than those stresses imparted by dynamic or static triggering, so the faults need to be “ready to go” if they are to be triggered. I plot the USGS fault plane solutions (moment tensors in blue and focal mechanisms in orange), possibly in addition to some relevant historic earthquakes. The focal mechanism from the 1977.08.19 M 8.3 earthquake came from Lynnes and Lay, 1988. 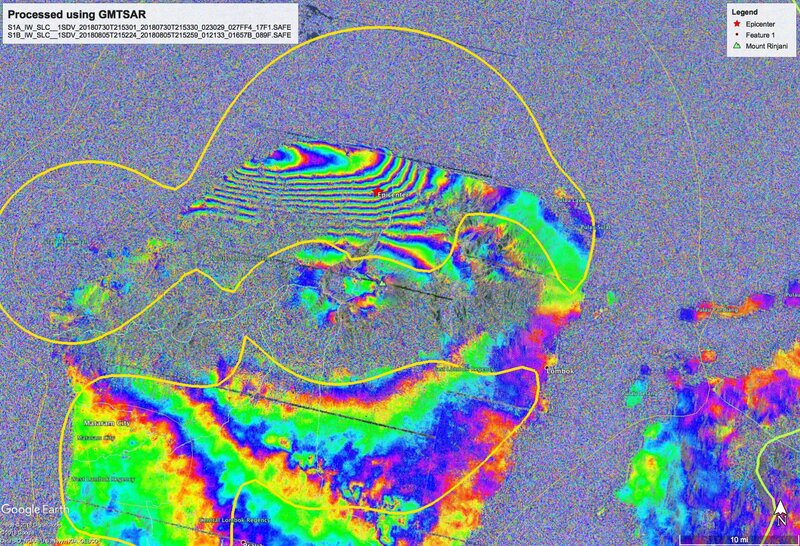 In the upper right corner is a low angle oblique view of the Sunda subduction zone beneath Java, Bali, Lombok, and Sumbawa (from Earth Observatory Singapore). I place a blue star in the general location of today’s earthquake’s epicenter (as for all figures here). The India-Australia plate is subducting northwards beneath the Sunda plate (part of the Eurasia plate). I include a blue star in the general location of today’s M 6.9 earthquake (as in other inset figures). 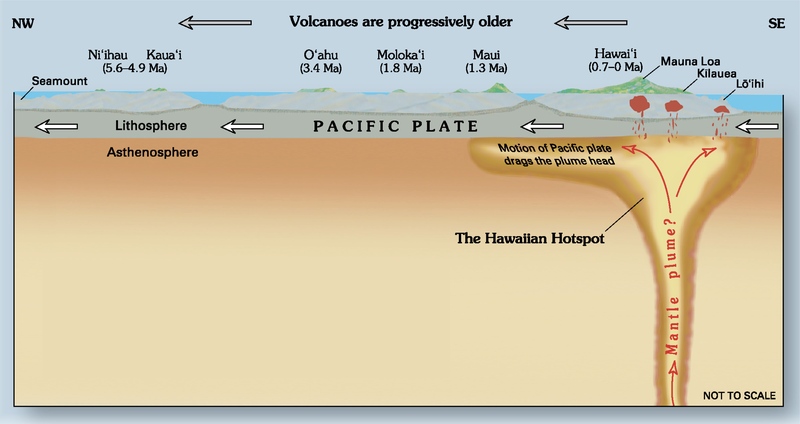 In the upper left corner is a plate tectonic map showing the major fault systems, volcanic arc islands, and oceanic plateaus and basins of the region (Darman, 2012). The map shows the Flores thrust extending as far west as Lombok. Compare the complicated tectonics in the eastern portion of this region compared to the western portion of this region. 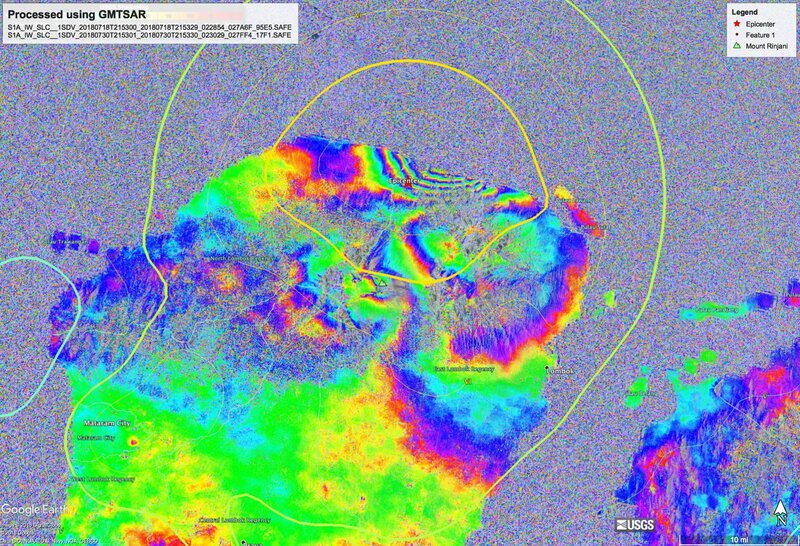 In the lower right corner is a cross section showing earthquake hypocenters (3-D locations) from Darman et a. (2012). To the right of the Darman et al. (2012) map is a figure from Lin and Stein (2004). Their paper discusses changes in static coulomb stress imparted by earthquakes in different configurations. The upper panel is a map view of how a thrust fault earthquake imparts changes in stress in the adjacent crust. Warm colors = increases in stress. Cool colors indicate decreases in stress. The fault in this example is an east-west thrust fault. Note how the region above the fault sees a decrease in stress while the region surrounding the ruptured fault sees an increase in stress. This is probably what is happening in Lombok right now. The 7/28 M 6.4 earthquake likely increased the stress in the adjacent crust, leading to the 8/5 M 6.9 earthquake. This (and the other earthquakes) also led to increased stress in the adjacent crust, probably triggering the M 6.9 earthquake from today. There is no reason to think that this won’t continue to the east or to the west. 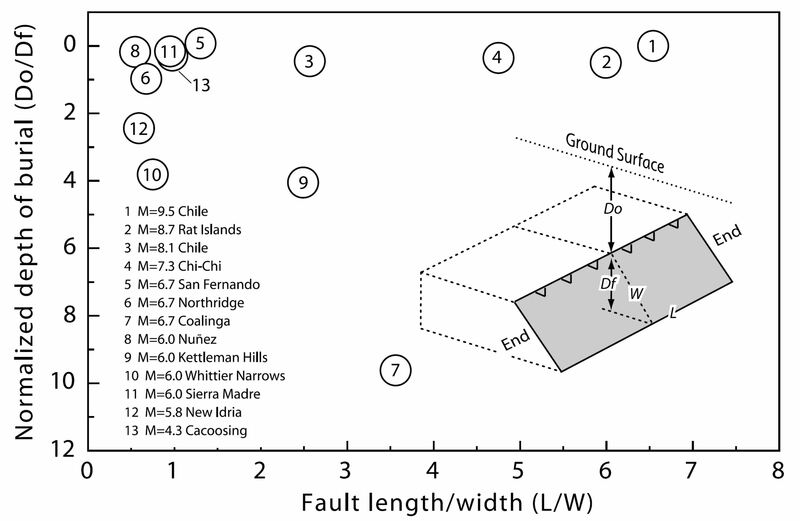 But we cannot really know if there will be a continued “unzipping” of these Flores thrust related faults. While the historic seismologic records are incredibly short (a century or less), there are no good analogues to this happening in this region (there are in other regions of the Earth). Here is an updated local scale (large scale) map showing the earthquake fault mechanisms for the current sequence. I label them with yellow numbers according to the sequence timing. 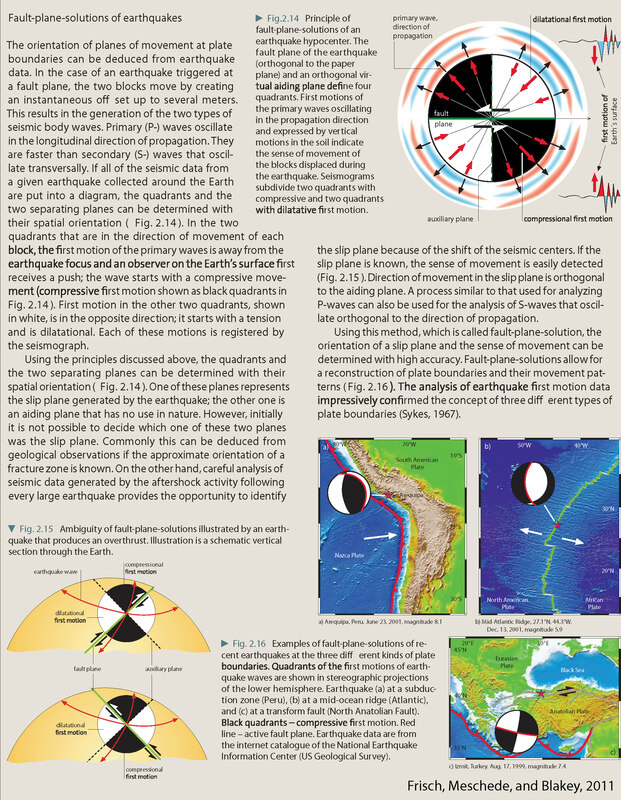 I outlined the general areas that have had earthquakes into two zones (phases). Phase I includes the earthquakes up until today and Phase II includes the earthquakes from today. There is some overlap, but only for a few earthquakes. In general, it appears that the earthquakes have slipped in two areas of the Flores fault (or maybe two shallower thrust faults). 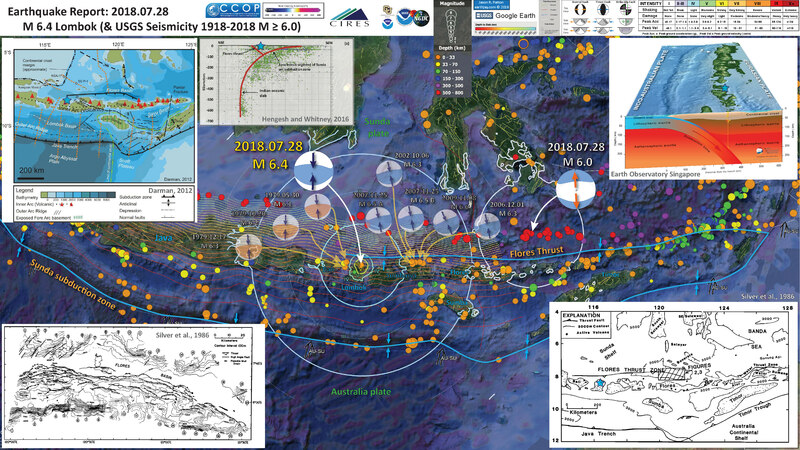 Here is the 8/5 M 6.9 earthquake map with a month’s seismicity plotted. Here is the 8/5 M 6.9 earthquake map with a centuries’ seismicity plotted. Here is the interpretive posted from the M 6.4 7/28 earthquake, with historic seismicity and earthquake mechanisms. Below are the maps and cross sections from Darman et al., 2012. Here is the map in the interpretive poster above. 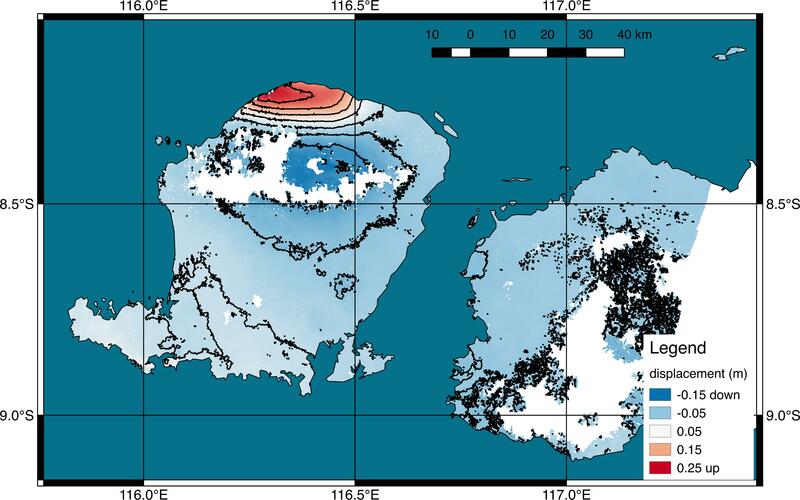 Tectonic map of the Lesser Sunda Islands, showing the main tectonic units, main faults, bathymetry and location of seismic sections discussed in this paper. Here is the seismicity cross section in the interpretive poster above. 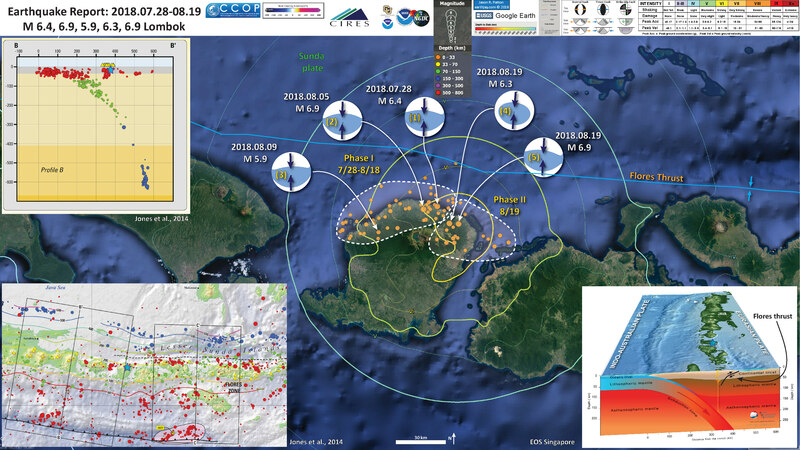 This plot shows the earthquake localizations on a South-North cross section for the lat -14°/-4° long 114°/124° quadrant corresponding to the Lesser Sunda Islands region. The localizations are extracted from the USGS database and corresponds to magnitude greater than 4.5 in the 1973-2004 time period (shallow earthquakes with undetermined depth have been omitted. Here is their interpretations of seismic data used to interpret the tectonics of the subduction zone and Flores thrust. seismic tomography on coincident profile P31 (modified after Lüschen et al, 2011). Here are some figures from Lin and Stein (2004). This first figure shows the geometry of thrust faults and also shows the range of parameters for earthquakes used in their analysis. Depth of burial as a function of fault length/width (L/W) ratio for some well-studied thrust faults. Burial depth is normalized by the vertical extent of the fault, as shown in the inset. Large subduction earthquakes tend to locate in the upper right; moderate size continental thrust faults tend to locate to the left. Sources are listed in the paper. This second figure shows the results from a cross section view for earthquakes used in their analysis. Increase in stress is represented by warm color. Cross sections (left) through the center and (right) beyond the end of the fault of a 45°-dipping thrust source fault. Optimally oriented receiver thrust planes are shown in areas of increased Coulomb stress. Both the 1971 San Fernando and 1994 Northridge faults dip about 45°. (a) The surface cutting thrust (Mw = 7.0) drops the stress in the upper crust, (b) whereas a blind thrust (Mw = 6.8) increases the stress over much of the upper crust, despite its smaller magnitude. Near-surface regions of stress increase are sometimes relieved by secondary surface faulting, as occurred in the Northridge shock. (c) Stress changes caused by blind and surface fault slip. (d–f ) Beyond the ends of the faults the stress distribution is relatively insensitive to whether the thrust is surface-cutting or blind, where the along strike projection of faults is dotted. Stress change caused by the 1 October 1987 Mw = 6.0 Whittier Narrows earthquake. (a) Map view of maximum stress change for depth range of 10.0–14.4 km, with seismicity (1 October 1987 to 31 December 1994, M ≥ 1.0, horizontal error <0.5 km) from Shearer  for the same depth range. The source fault model, shown by the black inscribed line, has tapered thrust slip on a 4.5 X 4.5 km fault with strike 270°, dip 25°, and rake 90°, following Lin and Stein ; receiver faults are assumed to have the same parameters. (b) Coulomb stress change in cross section cutting the center of the fault. The resulting stress component is shown in the top left-hand corner. (c) Normal stress change. Unclamping is positive. There were no earthquakes recorded during 1975–1987 at the minimum catalog magnitude of M ≥ 0.8 [Richards-Dinger and Shearer, 2000], and so the aftershock pattern is more likely a response to the stress changes imparted by the main shock than a continuation of the background seismicity. This is another cross sectional view of changes in stress imparted by a thrust fault earthquake. The upper panel shows the results for thrust “receiver faults.” Receiver faults are the faults that potentially are triggered through this process. Cross-sectional areas across the midpoint of a thrust fault, showing stresses imparted by a 30°-dipping blind thrust source fault on nearby (a, b) reverse and (c, d) strike-slip receiver faults. The pattern of stress change on strike-slip receiver faults differs markedly for long (Figure 5c) and short (Figure 5d) source faults. 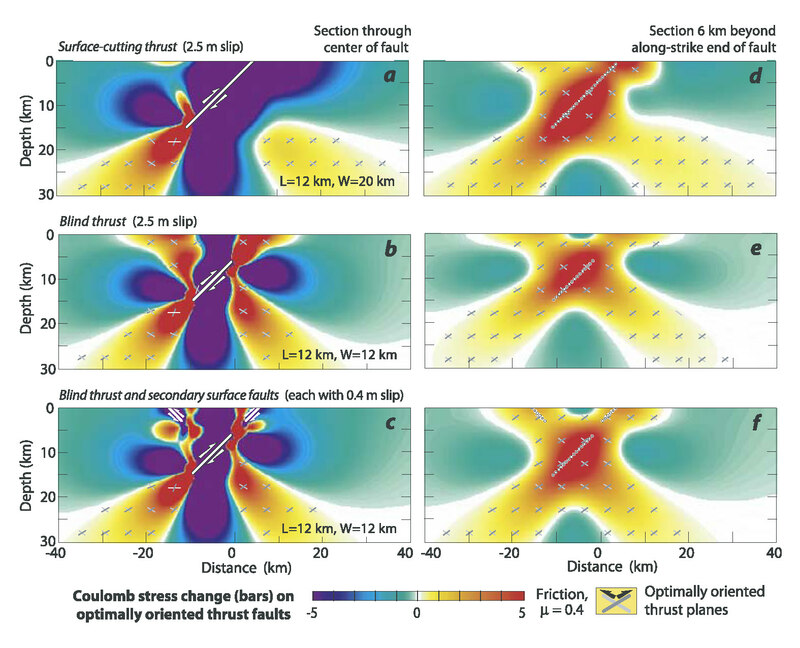 Strike-slip faulting is also enhanced above a blind thrust fault (Figure 5d). These cross sections can be compared with the map view for the same cases in Figure 4. This is North Lombok today….speechless…. Lin, J., and R. S. Stein (2004), Stress triggering in thrust and subduction earthquakes and stress interaction between the southern San Andreas and nearby thrust and strike-slip faults, J. Geophys. Res., 109, B02303, doi:10.1029/2003JB002607.